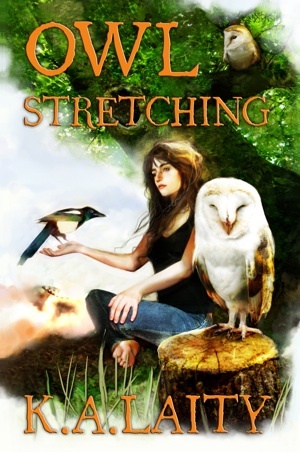 The big news this week is of course the reveal of the cover art for Owl Stretching, my novel out this month from Immanion Press. Another lovely Ruby design (she also did the cover for Pelzmantel and most of Storm’s books, too). It was quite a challenge to figure out what to put on the cover. They’ve made the decision to label it ‘science fiction’ — which it is, in part — so it may be hard to see in the small version, but there’s a space ship beneath the magpie. How cool is it that I have two book covers this fall with magpies? I miss my magpies. I like the barn owls, especially how the one on the stump looks like she’s smiling. I decided I can’t keep calling it a science fiction/urban fantasy/road trip/retelling of the Descent of Inanna, inspired by Kurt Vonnegut. Well, I can. But I probably oughtn’t. So brainstorming on Facebook, I said I should just use the tagline “Shamans v. Aliens” which of course borrows from the comic/film Cowboys v. Aliens (silly as it sounds, I found it a rather fun film; I think it has done better on DVD than it did at the box office). I know it should be ‘shamen’ as a plural but I didn’t want people to think of the Scottish band and anyway, they’re mostly shamankas anyway (i.e. women). ‘Shamans v. Aliens’ — I like it. Other news: blood poisoning nearly gone, throat infection, too. Up to Albany tomorrow and I’ll finally be able to see some folks and my Kipper. I’m still pining for Dundee and my sweetie, though I’m still living on the side of a hill. I climb up Blue Hill and look down below, expecting to see the Tay. Off in the distance I can see the Berkshires. Once over the top I can see the Catskills off to the west. Near the Hudson, but can’t see the river from here. You may know someone like this: “Open Letter to a Social Media Pill,” my latest at the Short Humour Site. If you want to keep up on writers behaving badly, see Claire McGowan’s write up and then poke around Steve Mosby’s and Jeremy Duns’ twitter feed. Next Post Nun & Dragon — and Pirates! I like the ‘Shamans and Aliens’ tag!